Tonight on the ABC Family THE VINEYARD continues with a new episode called, “Cat Fight.” On tonight’s show Katie begins to second-guess her recent choices, while Ben asks Gabby for a job. Did you watch last week’s episode? We did and we recapped it right here for you. On last week’s show Jackie learned the real reason behind Luis’ surprise visit to her house and believed that the best way to get over him was to ask Jon out on a date. A devastated Luis realized he couldn’t spend the rest of the summer in such close proximity to Katie and decided the only thing to do is leave Martha’s Vineyard and return home. Jon’s carefree attitude toward women caght up with him when Emily and Jackie compared notes. Katie began to second-guess her recent choices, while Ben asked Gabby for a job. Meanwhile, an incident at a local party led to a new understanding between rivals. On tonight’s show Katie is thrilled when Luis returns to the island; they decide to explore their feelings for each other, but will the fact that she still has a boyfriend threaten their happiness? Daniel decides to host an all-white party as a showcase for Sophi and to thank the islanders for their hospitality. Determined to ensure that the event is a smashing success, Daniel enlists Jackie’s help to book a few local musicians to provide entertainment, including Ben Taylor (son of Carly Simon and James Taylor). Jon realizes he made a mistake and tries to win Emily back, but he’s going to have to make more of an effort than he’s used to. Meanwhile, Cat is convinced that Katie is going to hurt Luis, but will her unwanted involvement in their relationship ultimately end her friendship with the one person she’s come to depend on? Tonight’s episode is going to be another fun one, which you won’t want to miss. 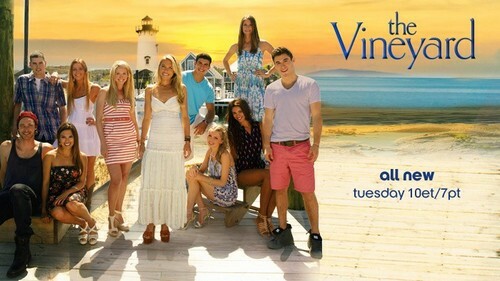 So be sure to tune in for live coverage of ABC Family’s The Vineyard Season 1 Episode 6 “Cat Fight” — tonight at 10 PM EST. Everyone is waking up. Making breakfast or on the beach running. Luis knocks on Katie’s door and finds him there grabbing her into a kiss and a hug. Emil and Luis lay their feelings out since he is back and she says that there are a lot of things that she needs to figure out. Luis says that he is there for her. Sophie and Daniel are packing and bickering. Daniel is talking about throwing a huge Martha’s Vineyard party and that she can sing at it. John walks in and borrows Daniel to talk. Jon is taking him out to fish as he apologizes for what happened and that he overreacted. Daniel says it’s no biggie and that friends just fight sometimes. Jon wants to show Emily that he is worth her time.Luis calls Cat wanting to spend time with her and surprises her by being right behind her while they’re on the phone. He tells that why he is back and the note that Katie wrote him. She is very skeptical of his decision. Katie is telling Cat about what happened at the wedding and that she knew that she had feelings for Luis and that that was why she wrote the note to him. She felt like she had made a huge mistake and when he surprised her at her door. Talking about how she is still in shock and trying to call Matt to talk about what is going on with her but she can’t get ahold of him while he is out of the country. Jackie and Daniel are talking about Jon and what happened with Emily. Daniel tells her that he can’t get in the middle of it because of the situation blowing up with him and Jon. he asks her for a favor to help him get the party together for Sophie to sing and that he wants it to be big. The theme to the party is a “White Party.” He admits that he has a little bit of a crush on Sophie. Jon was hiding in the back of Emily’s car asking to drive him where she’s going. Katie goes to Jackie’s mom’s house to talk to her about Luis and what she should do about Matt. She tells her that she shouldn’t feel bad about it but that that’s not the kind of talk that should happen over the phone. Tells her to tell Jackie that she came by. Katie stops on her bike to call Matt. Ben and Cat continue to talk about him becoming her boyfriend. She talks about her boyfriend last summer and that it sucked. She says yes and they kiss.Jon and Luis are out grilling. Luis tells him that they are almost official and that he is giving her the time to take care of her business with Matt. Jon tells him about the shells in the sand apologizing to Emily but she said that it’s not what she wants. Luis tells him to keep at it and not give up. Jon meets Emily on the beach again. He picks her up and puts her in a small boat to show her something. They’re having a good time. He brings out a captain’s hat for him and another one for her. He asks her again for a second chance with her.He gives her a necklace made of pearls in a fancy design as well as a bracelet of the same material. She says yes and they kiss. Ben, Cat and Luis are shopping for party clothes when Katie shows up. Cat does not approve of Katie and Luis. Ben says it’s none of their business. Cat goes over to talk to Luis and asks if she’s broken up with Matt. He says he doesn’t want to do it there. She brushes past him to talk to Katie about how she feels about the situation. Ben talks her down from talking to Katie right before she gets to her and they go back to shopping. Jackie and her mother are talking about her friendship with Katie and Luuis. She tells Jackie that is she’s her friend, she should have all the information about what happened before it becomes a mess and makes her look bad as well as hurt Katie’s feelings. Daniel is welcoming everyone to the “White Party.” Jon and Daniel are talking about Sophie and how good she looks. Jackie tells Gabby about the night that Katie and her talked about Matt. Jackie wants to tell Katie about her and Luis hooking up. Gabby tells her to let it go and that it would only make things worse. Daniel gives a speech welcoming everyone to the party and introduces Sophie to sing.Everyone is watching her intently while seeing their own problems in their eyes. Daniel is watching her with a warm look on his face. She gets a round of applause after her song is over. Jackie walks over to Katie and says that they need to talk about Luis. Jackie chickens out and tells her that they look so good together. Ben sees Cat staring at Katie and tells her to stay out of it because it’s not her business. Daniel introduces Ben Taylor and friends onto the stage. Cat goes over to talk to Luis. She says she can’t sit back and watch this happen. She says she’s going to hurt him and asks if he knows why Katie hasn’t broken up with Matt yet. He says again that he doesn’t want to do this in public. Sophie hugs and thanks Daniel for the party and how excited she was about being on stage. She says that she met someone and gave them her number as she hugs Daniel and says goodbye. Katie and Luis are going to meet in the park. Cat follows Katie. She asks what is up with her and Luis and why she still has a boyfriend while hanging out with him. Luis walks up and asks why Cat is doing that. Luis tells her that their friendship is over because she continues to involve herself in the situation. Katie calls Matt as the scene ends.